Termite Control in Miami | What Do Termites Look Like? Prevent an invasive swarm of wood-consuming insects from eating away the structure of your home with the help of our termite control process. Termites thrive in moist environments, and many of the homes in South Florida are ripe for an infestation. Your home is one of your biggest investments, and these insects have the potential to cause you thousands of dollars in damage if you don’t act right away. Termite infestations can go undetected for a long time and cause serious damage to your home or business. They can make their way through wood, plaster and metal and end up inside your home feeding. If not immediately and professionally treated, termites can cause expensive and irreparable damage. Our technicians are highly trained to identify the source of a termite colony and implement a plan to eradicate it, even for our Spanish clients, we offer exterminador de termitas en Miami. Stop these bugs before they start by getting a termite inspection from our company. You may ask yourself, what do termites look like? We help you understand what to look for if you think you may have an infestation on your hands. 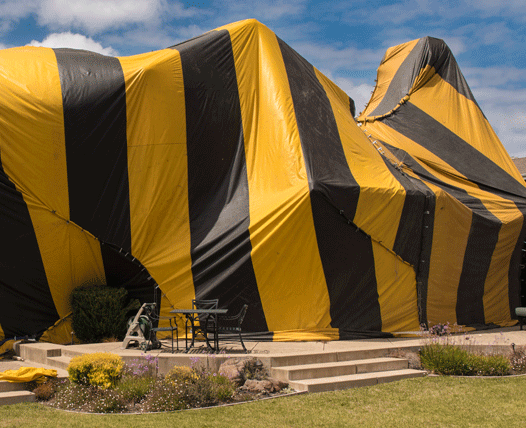 Act now and get termite treatments that help you keep the bugs out for good. Our approach to termite control is focused on protecting your home and saving you money. Protect your home from the threat of termites and avoid the expensive and irreparable damage they have the potential to cause. They thrive on soft and moist wood for food, and your home could be filled with sources of food for these pests. By the time you first see them out in the open, a thriving colony could already be under your home. Choose a bilingual pest control exterminator that is licensed and insured when your home or business is at risk of an infestation by termites. When you notice any structural damage to your home, or you see drywall begin to deteriorate, it is critical that you call our company right away. If not treated properly, these pests have the potential to make their way through the foundation and metal below your home and into your cabinets and framing. Take advantage of the latest advancements in pest control techniques with our broad array of termite tenting and other pest treatments. With products like Termidor™, termites feed on a low toxicity agent that they then spread to the rest of the colony. Every home presents a different challenge to pest control experts. That is why we provide our customers with an exhaustive review and inspection before we apply our strategic termite treatments. Get an accurate picture of the threat your home faces with our termite inspection. Understanding the nature of the threat posed by these insects is the first step in eradicating them from your home. With our thorough inspection, your home is reviewed from the edge of your yard to the top of your roof, to find where termites may be hiding. Your home is too valuable to take a chance on the threat of termites. Understanding how these bugs operate and where they are most likely to thrive is also important when you are protecting the structural integrity of your home. The first step in protecting your home from invasive wood-destroying insects is answering the question, what do termites look like? Termites come in a variety of colors including white, brown, and black, and they are often confused for flying ants. They have the potential to grow as long as one-inch in length, and they often shed their wings. Termite antennae have straight antennae, as opposed to the elbowed variety found on worker ants. If you have any question about the insects you have found in your home, call us right away for an inspection. Contact us today for a free inspection of your home or business when you are in need of termite control. We proudly serve customers in Miami, Miami Beach, Kendall, Homestead, and Coral Gables, Florida, and surrounding communities.